We offer an on-site and outreach service to all interested groups. We have special programmes available and we can tailor make visits to suit requirements. This could involve talks, walks and indoor and outdoor activities. Are you a Tour Group, Field Studies Group, local group e.g. Active Retirement Group, Tidy Town Committee, Mens/Hens Shed? We are delighted to welcome local groups and those from further afield. We welcome and appreciate all groups. Private Guided Walks for groups (over 6 people) may be arranged by contacting the Visitor Centre. 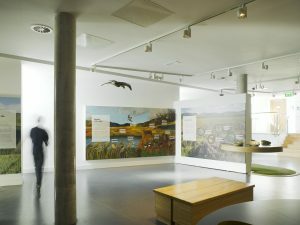 Our Interactive Exhibition captivates visitors of all ages and offers an overview of the Local Community, Local History and the unique Atlantic Blanket Bog System. 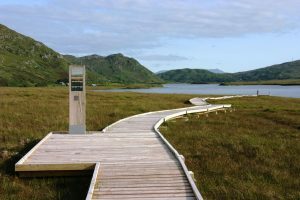 Take a leisurely stroll along the Tóchar Daithí Bán Nature Trail (Visitor Centre) and experience panoramic views of Achill Island, The Nephin Beg Mountain Range and the Atlantic Ocean. This is a 20-30 minute walk which can be easily undertaken by individuals or groups. 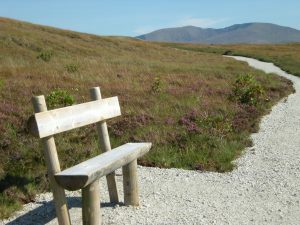 There are FREE Guided Walks of the trail which will commence in July and August 2019. Claggan Mountain Coastal Trail is situated on the Wild Atlantic Way between Mulranny and Ballycroy and is the perfect location for photographing this stunning area. You will find ample parking and a gentle 1km boardwalk though Atlantic Blanket Bog and 1km return along a stony sheltered shoreline. The Ginger & Wild Café offers a wonderful light spacious seating area with a bird’s-eye view to Achill Island, the majestic Nephin Beg Mountains and the magical wild Atlantic coast. The food is all homemade using locally-sourced produce and quality ingredients. The fare is simple and fresh – teas, coffees, soups, scones, cakes and light lunches. 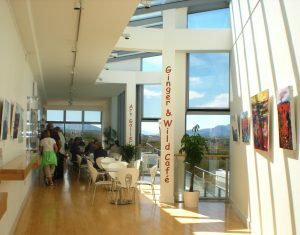 Ginger & Wild Café is also home to The Stronach Gallery which houses a changing collection of Irish and International artists.